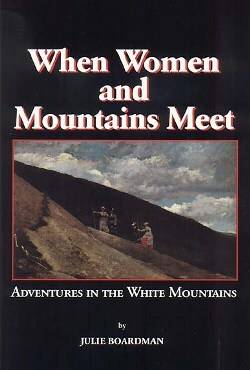 When Women and Mountains Meet, by Julie Boardman, 2001. Relates the stories of some three dozen remarkable women who have shaped the history of the White Mountains, including early settlers (Lucy Crawford, Dolly Copp), explorers (Lucia and Marian Pychowska, Martha Whitman), activists and conservationists (Katherine Sleeper Walden, Anna Stearns), writers (Lucy Larcom, Annie Trumbull Slosson), and mountaineers (Marjorie Hurd, Miriam Underhill). An excellent read. 162 pp, 5 1/2" x 8 1/8".